America’s AirSea Battle vs. China’s A2/AD: Who Wins? Military realities aside, there could be no winners in a clash between China and the U.S.
A recent query from a colleague asked a very simple question: If America’s AirSea Battle (ASB) was ever called into service against China’s anti-access/area denial strategy (A2/AD), who wins? Yikes. The simple answer, without making loyal Diplomat readers suffer through a 10,000 word academic slog is… no one. But first, allow me to back track a bit. One key aspect of both ideas that gets lost in the mix is in what situations conflict could occur and the possible escalatory nature of such a conflict. When it comes to a potential showdown between ASB and A2/AD, the devil is truly in the details. While pundits love asking and analyzing what weapons could be deployed and how they would be used, the situation in which such weapons come into play and what happens next is equally important. Context in a situation like this matters. 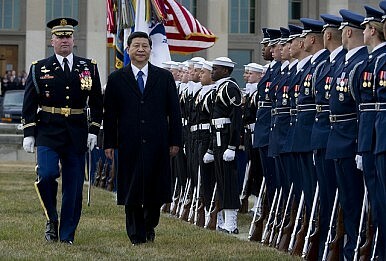 Let us consider for a moment the possible flashpoints in which U.S. and Chinese forces could clash. The two that come to mind would be some sort of escalatory crisis over the Senkaku/Diaoyu Islands or a situation involving territorial tensions in the South China Sea. Of the two, the greatest chance of conflict — albeit remote despite current tensions — would be some sort of China-Japan conflict in the East China Sea. The most likely scenario would involve an accidental collision of maritime vessels or aircraft. Diplomatic efforts fail and for some reason, someone escalates matters and attempts to either land troops on the disputed islands or shooting accidently begins. In such a scenario, let’s assume American forces come to Japan’s aid. So what happens next? Making predictions on such a scenario is nearly impossible, but we can draw some conclusions from the writings of Chinese and American scholars on the subject. When considering China’s A2/AD strategy, one popular theory is that China would go all in – launching massive saturation missile strikes on American and Japanese bases to gain the advantage and attain victory quickly. Missiles of various ranges and capabilities could be launched on allied airfields early to negate any advantage in technology or training. Anti-ship weapons would be used in mass to cripple naval forces – cruise and ballistic missiles specifically. Sea mines and submarines could be positioned around the disputed islands in an effort to deter reinforcements from deploying to the area. Anti-satellite weapons could be employed to blind allied forces and damage vital C4ISR, and cyber weapons could be utilized to gain the upper hand. Many Chinese strategists even make the argument that it is to Beijing’s advantage to attack first, in mass and with overwhelming force – a Chinese missile-centric “shock and awe” if you will. How would America and its allies respond? Again, making such predictions is difficult and much would depend on who struck first. If we assume a Chinese opening assault, first and foremost, American and allied forces would attempt to retain access to sea lines of communication (SLOC) and the ability to move forces into the area of dispute in order to bring overwhelming military power to bear. Defense against Chinese missiles could prove a challenge if the number of missiles employed in offensive operations was greater than the number of interceptors available. American forces — if intelligence assets could detect an impending launch — could attempt a preemptive strike on Chinese conventional missile forces. They could also employ cyber strikes against the guidance and navigation systems of such weapons, in order to avoid escalating the situation by attacking the Chinese mainland. U.S. military planners would also seek to degrade Chinese command and control systems in an effort to blind the ability of PLA forces to conduct operations in any sort of synergizedway. While many revel in the operational details or the possible employment of sci-fi like weapons and new military tactics, the key in any conflict is how decisions like dialing up or down military force would be made. How would China or the U.S. and Japan decide to escalate the conflict to say strikes on command and control satellites, or utilize cyber weapons that could have cross over effects beyond military targets? How would brave men and women on both sides make such judgments when the U.S. and China hold nuclear arsenals that could kill billions of people? Then this is where it gets very interesting. A clear Chinese or Allied win would obviously have regional if not global implications. What if neither side gained a clear victory? Of all the possible scenarios when one thinks of the potential end game, a conflict that results in stalemate could be the most frightening of all. Does South Korea or Japan consider building nuclear weapons? Does a Cold War scenario develop between the U.S. and China? Does a budding arms race in Asia intensify? It seems even greater instability would be in Asia’s future. Truth be told, such a scenario is worthy of a larger study (war game anyone?) and discussion than a simple blog post can offer. There would be many more moving parts that would need to be considered to make it comprehensive. Hopefully, if an accidental shooting match did ever occur over the islands of the East China Sea, cooler heads would prevail before any blood was spilled. While theorizing over competing military ideas makes for interesting discussion, the stakes in any conflict would be very real. The only certainty in all of this: no one wins, everyone loses.